( so it becomes more crispy ) crush the onion with hand or in a Mixer Grinder. 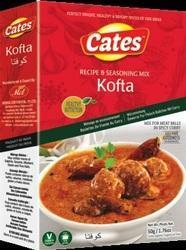 We facilitate our clients with a distinguished range of Kofta Spice Mix. Our broad range is an accurate blend of diverse ingredients. These spices are used to augment the taste of various Kofta. In order to sustain their freshness and purity, these masalas are packaged in quality packaging material. Indiana Kofta Masala is known for its liberal use of different spices mixed in a proportionate quantity to authentic taste and enhances the savor and flavor of the dish extensively. Kofta usually refers to a meatball. Made with chicken mince or pounded lamb. A soft satisfying vegeterian version can also be made with potatoes and cottage cheese or vegetables, which you can add to a delicately spiced thick and creamy sauce.